Final Fantasy X'sAnima is not only a challenging opponent and a powerful summons. She's actually the mother of Seymour, the game's arch-villain! Her terrifying appearance is a reflection of the grief she feels at being used by her son for evil ends. Anima is a unique, tragic character who's partly inspired by Jungian psychology and Catholic iconography. On this page I'll show you how to defeat Anima in battle and how to acquire Anima as an aeon. More than that, I explain who and what Anima really is. 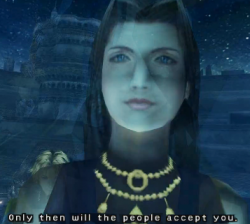 Her story adds yet another tragic side-plot to the epic/mythic adventure of Final Fantasy X. It is a story you may have missed. The one thing I can't tell you is how to defeat Dark Aeon Anima, since I don't have the International Version of Final Fantasy X. Here's a Dark Aeon Guide that should help. Good luck! Monitor Anima's Overdrive gauge and make sure you've got an aeon summoned before she inflicts her Overdrive Oblivion. Remember that elemental aeons can heal themselves with their own element. With that aid, Shiva can beat Anima. If your characters are low level (easy way to tell: Macalania Forest's fiends kept KOing them), summon Ixion first to soften up Anima, and use him through Anima's first Oblivion before bringing in Shiva. Otherwise, you can just summon Shiva immediately (scroll down and select ???). Alternate between attacks and healing Shiva with Blizzara. When Shiva's Overdrive is full, her overdrive Diamond Dust should finish off Anima and get the "overkill" bonus. Tip: BEFORE you deal with Anima, prepare for Seymour's powerful multicast elemental spells, which he uses when cornered. When the Seymour battle starts, Haste Yuna and have her keep casting Null spells, so your party is well-protected when Seymour summons Anima and will be ready when she falls. How to Get Anima: In each temple's Cloister of Trials, unlock the secret chest with a Destruction Sphere (it still counts if you sell the item inside). Visit Baaj Temple on the airship once you're allowed to steer it. Inside Baaj, there's a room that's a record of all the cloisters whose key items you've found. Go back if you've missed any. Yes, Zanarkand too! Sounds easy, right? There's just three problems. 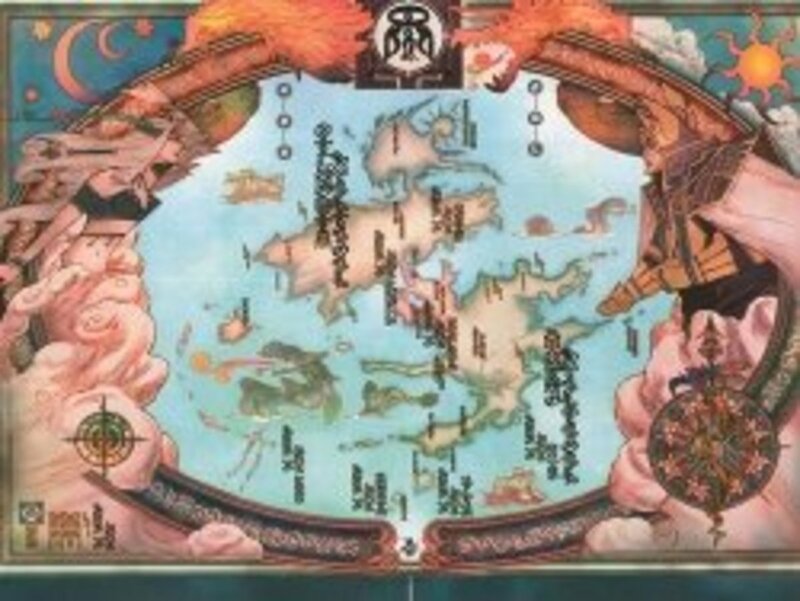 1) Baaj Temple isn't on the map. You have to search for it. It's one of the western islands south of Kilika, almost hidden under the clouds. Give up? Hover over this link to see Baaj Temple's coordinates. 2) The entrance to Baaj Temple is guarded by a nasty boss, Geosgaeno, with a nasty "Stone Punch" that turns characters to stone and shatters them. Bring Stone Ward or Stone Proof if you can. 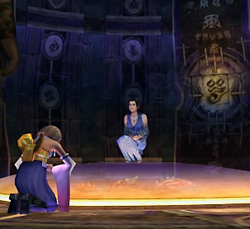 3) You'll get chased away from the temples... until it's announced that Yuna is not a traitor. Then you can go back for the items you missed -- be sure to talk to the Fayth! Don't worry about Bevelle. Many FAQs erroneously say it's possible to miss that cloister's key item. They're wrong. The Knight Lance is a great item, but Anima's key item is an HP Sphere in a chest blocking the way out. You can't leave without opening that chest. A good thing, since you can never return! This video has good tips, but note they didn't use my trick of getting all the Null spells up at the beginning of battle and maintaining them. They nearly pay the price at the end. To refresh your memory: the biggest tournament of the year is disrupted by monsters. Seymour has just been appointed Maester, a senior political and spiritual official who's relatively unknown. In a brilliant PR move, he "rescues" everyone. Nobody thinks to ask the obvious question: who smuggled those monsters into the stadium?! I hate summoning Anima because she's so icky, but take a closer look. Notice the pendant hanging around her neck. There's a figure painted on it, almost like a Catholic saint. Who...? What's the Story Behind Anima? SPOILERS BEYOND THIS POINT- Don't Read Until You Get Anima! 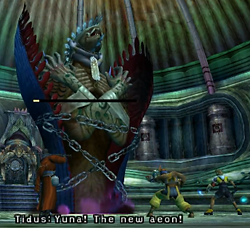 Immediately following Seymour's staged spectacle in Luca, Yuna says in awe, "Seymour's aeon...it was so powerful." That's clue number one. Clue number two comes when your party reaches the ghostly city of Zanarkand. Among other weird flashbacks, our heroes catch a glimpse of Seymour, aged 10, and his mother, visiting the ruins. What were they doing there? Seymour (weeping): No! Mother, no! I don't want you to become a fayth! Seymour: I don't care about them! I need you, Mother! No one else! Mother: I don't...have much time left. Seymour's mother chose to become Seymour's Final Aeon, sacrificing herself to become a powerful spirit. She intended for Seymour to use her to defeat Sin, save the world, and win honor and acclaim as a hero. Instead, he claimed her as his personal aeon -- a Final Aeon, the most powerful being in Spira next to Sin -- and used her as a tool to power. Here she is in all her painful ugliness. The detailing on this figure is pretty good, and includes the telltale Catholic icon (see below) of "Anima" dangling from aeon's necklace. Seymour's mother shouldn't take all of the blame. If you talk to an old woman in Guadosalam, she reveals that Jyscal's marriage to a human woman scandalized the Guado, that they rebelled after Seymour was born, and that Jyscal banished the boy and his mother to Baaj Island in order to appease his own race (and retain power). 28 years ago [prior to start of game]: Seymour Guado is born to Jyscal Guado and a human woman. 25 years ago - Jyscal becomes leader of the Guado and spreads Yevon's teachings to the tribe. 20 years ago - Internal discord intensifies within the Guado tribe. Jyscal prevents disunity in the Guado by banishing his wife and child to Baaj. 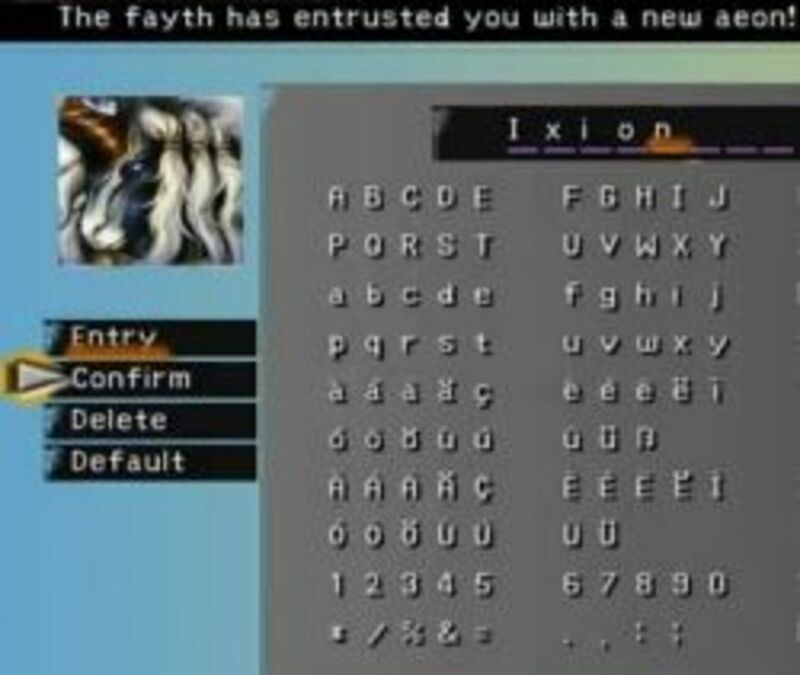 18 years ago - Aware of her impending death, Seymour's mother travels to the Zanarkand Ruins along with her son and becomes the fayth for Seymour's Final Aeon, Anima. Seymour refuses to accept his mother's power and returns to Baaj. 10 years ago - With the arrival of the Calm, the Guado's internal discord subsides. Following that trend, Seymour's exile is revoked. He returns to Guadosalam and assists his father as a priest. 3 years ago - Seymour assumes the post of high priest of Macalania Temple at Mika's nomination. He secretly travels to the Zanarkand Ruins to acquire Anima. He then transports its statue to Baaj and seals it. - (Right before game begins) Jyscal dies. His son Seymour assumes leadership of the Guado as well as the mantle of maester of Yevon. We're left wondering about the origin of Anima's statue, but the gist is clear enough: Final Fantasy is the story of not one but three children inheriting the burdens and sins of their fathers: Yuna, Tidus, and Seymour. 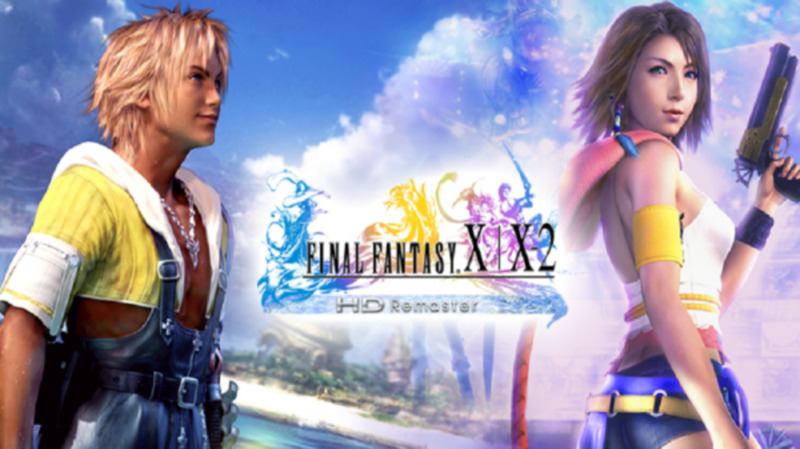 Each of them charts a different path: Yuna follows in her brave father's footsteps, Tidus redeems his father, and Seymour betrays Jyscal. In the Greek Oedipus myth, the parents exposed their infant son on a mountaintop, intending for him to die, because he was prophesied to kill his father and marry his mother. Not knowing his real parents, he fulfilled the prophecy by accident. However, Freud borrowed the myth to describe tangled affections and frictions between mothers, fathers, and sons. There's two, perhaps three Oedipal Triangles at work in Final Fantasy X.
Yuna's is the sane one. She's Daddy's girl, and her poor mother is nameless. This is more of an Electra Complex, if you know the jargon. 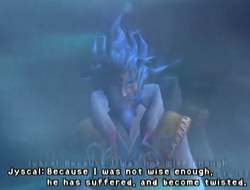 Tidus' Oedipal tragedy is dysfunctional, but resembles everyday life -- apart from that whole "dream" and "Sin" thing. Tidus hates his dad and is jealous of his mother's affection. 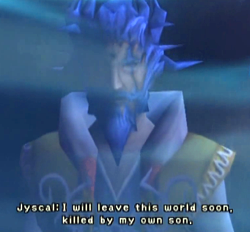 Since FFX is more myth than reality, the killing-Dad part of the myth is carried to its literal conclusion. Seymour's is the nastiest version of the myth, killing his father on purpose to supplant him. He doesn't sleep with his mother, but he does chain her and lock her as a fayth inside his heart. In a peculiar variant of the original myth, Seymour is banished with his mother. 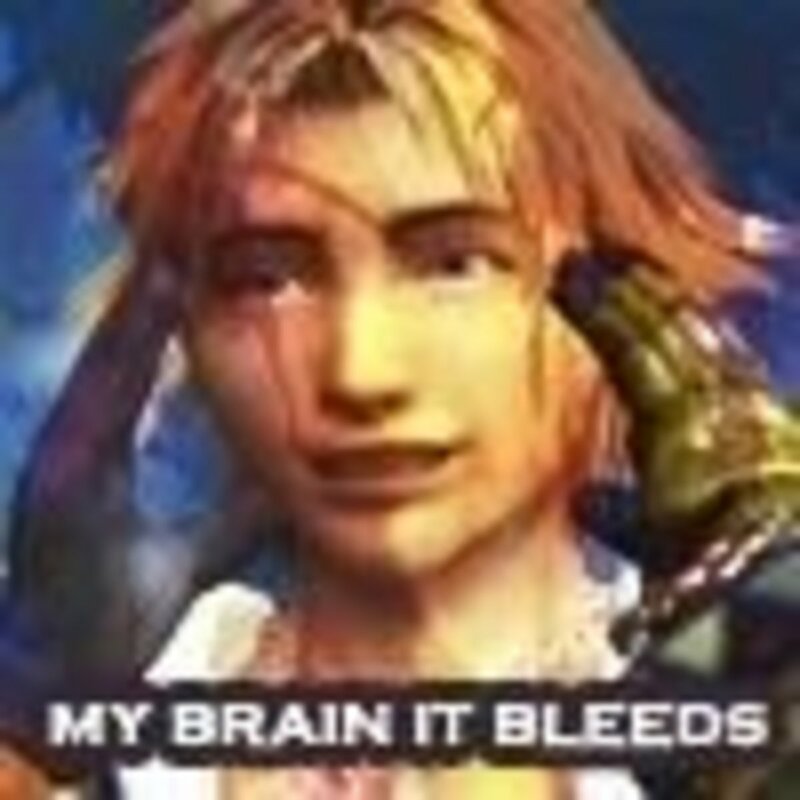 I don't think the Freudian elements in FFX were put there on purpose; I think it's a recurring mythic pattern rearing its head by accident. 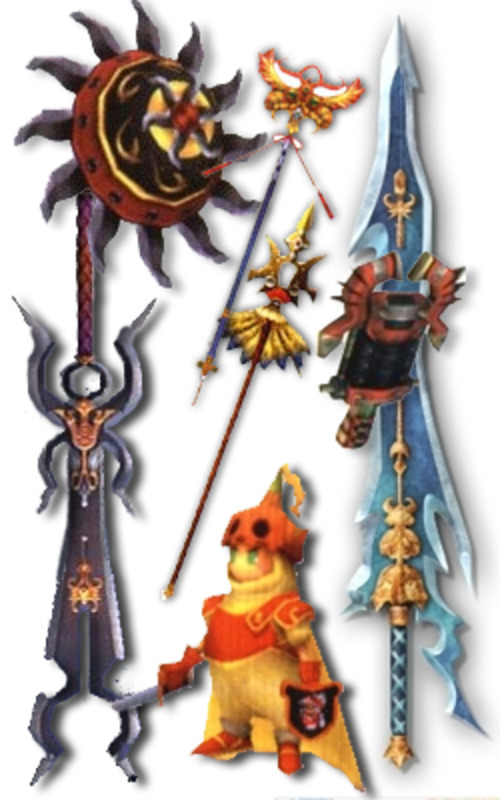 However, some of the Jungian symbolism in FFX seems to be deliberate. Namely, Anima! Jung argues that since human life follows certain basic patterns, our psychology follows certain patterns, too. That's why we have recurring motifs in myths, stories, and video games! One important pattern is the anima. Writing in the mid 20th century, Jung argued that gender is partly a matter of psychology, of suppressing parts of ourselves that don't fit into our culture's definition of male and female roles. Women tend to suppress "male" traits, which become their animus. Men suppress nurturing, emotions, sensitivity, and other so-called "feminine" impulses, which get buried down in the unconscious as an anima. Things buried in our unconscious manifest as dreams, as strong emotions, and as symbols. They get personified, turned into myths. The Anima can speak to her man as a Muse, Mother Mary, Lady Luck, Sophia, various goddesses, or (with guys repressing so much that she fights back), devouring mothers. I'm not sure I buy all that, but I suspect the design team for Final Fantasy X chose the name "Anima" with Jung in mind. It's not a perfect fit, any more than Shiva or Odin resemble their real-world myths exactly. But Anima is Seymour's repressed -- chained feminine side, the voice of compassion shackled, enslaved and forced into a tool to power -- and thus corrupted, manifesting as a monster weeping blood. Oddly, there are other Animas in this story. Jecht's wife and Braska's wife never get named either, and seem to serve solely as motivating, inspirational forces for son or husband. The Catholic Image of "Anima Sola"
But wait! Perhaps the aeon's resemblance to Jung's Anima is a coincidence? 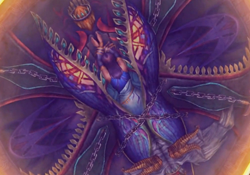 There is a real-world, mythical figure, Anima Sola, whose iconography matches that of Anima in Final Fantasy X.
Anima Sola, the "Lonely Soul," is the image of a woman chained and consumed by flames. She is a widespread figure in popular Catholicism. Unlike saints, people do not pray to her, but for her. She represents the souls of those suffering in Purgatory. There are particular legends about a woman who refused to give Jesus water and was condemned, or a woman condemned to Purgatory through unrequited love: she placed more importance in temporal love than salvation. Generally, however, the emphasis is on her suffering and our compassion for her, not for her sins. 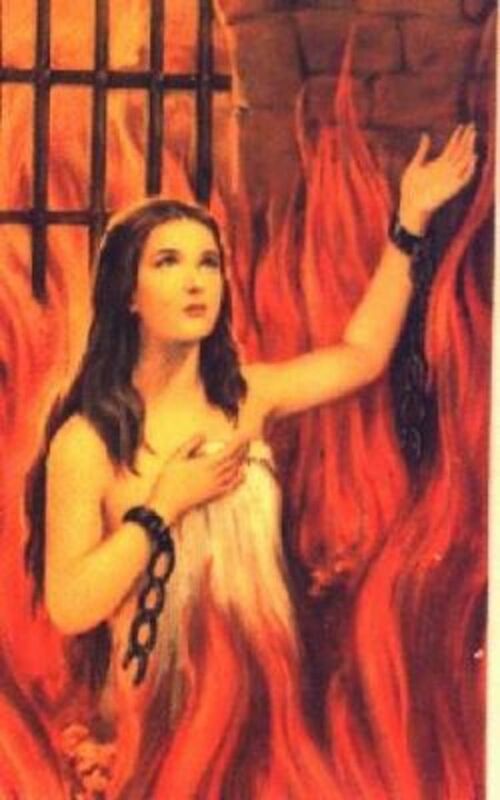 She is usually portrayed as penitent, and her chains have broken. 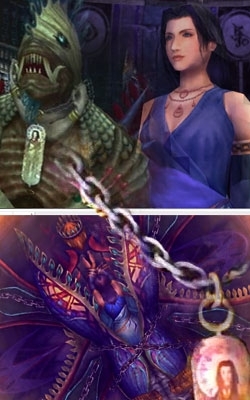 The story of Anima Sola does not match FFX as well as Jung's anima, but the chains and shape of the aeon resemble a macabre version of the standard Catholic icon. More strikingly, the aeon wears a portrait of Seymour's real mother as an icon around its neck. I hope you enjoyed this rather long-winded page devoting a lot of blather to an obscure video game character. There's a reason why I love the character of Maechen the Scholar. Seriously, though, it's details like this which first drew me to Final Fantasy, and Final Fantasy X in particular. These games take old myths and timeless archetypes and weave them together in new ways, creating new myths in an emerging medium. 3700 years ago, it was, "Sing, Goddess, the wrath of Achilles..."
Now it's a video game character drawing us into a magical adventure with, "This is your story. It all begins here." Now we can enter epic, virtually. Guestbook - Thanks for Visiting! I'm currently writing an essay that looks at religion within Final Fantasy X and this was wonderfully helpful. It's such a shame the Ultimania books aren't available internationally. Thank for taking the time to share your insight and sources. It's much appreciated! I am doing research on Anima from FFX and looking for photos/videos of her and stumbled upon this page... I am SO happy I did! Not only is this well-written (and easy to digest considering the nature of Anima and theories you bring up about her possible causes for being a part of FFX), but the content is spot on with what I always attributed to her as a character. I love that the you included detailed write up on Anima/Animus and also the religious view of Anima. The theories all lead to a strong case on why this Aeon is so powerful and why she is a tragic heroine as well (under Yuna's power at least). The video clips are really well placed throughout the article and provide backup for what you've written. I'm overjoyed at finding this page because everything I was hoping to find has been laid out right here. I'm going to sift through the rest of this site to see if I can't find more pages you've written here on anything partaining to games I've played (hoping to find more on FFX). Well done and thank you again for taking the time to write out this detailed story on the most powerful Aeon in FFX.